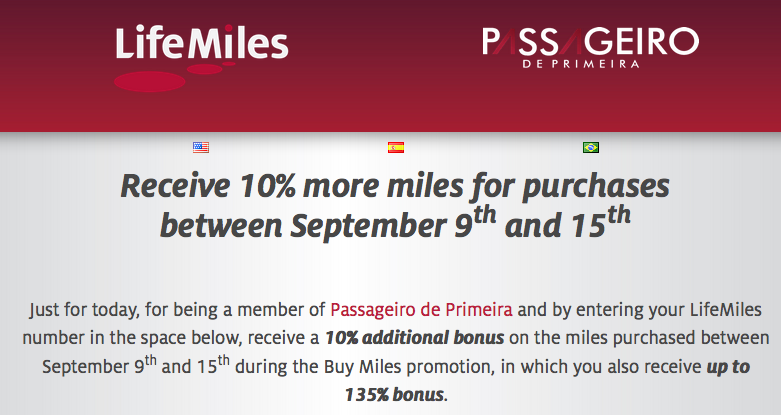 Avianca LifeMiles has been famous for selling their miles with a 100% bonus every few months and then in the spring of this year they upped that to 120%. Now with the latest bonus it has now jumped to 135%!!! 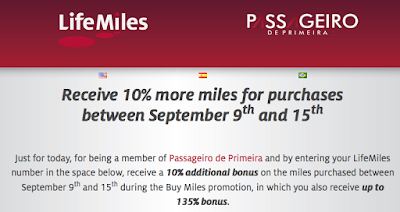 But wait it gets even better, for the first few days of this promotion LifeMiles has teamed up with Passageiro De Primeira to add an extra 10% on top of the 135% for a 145% bonus if you buy at the highest tier bonus. To earn that extra 10% you must register today and buy by September 15th. If you have followed us for sometime you'll know this is a decent option to get Star Alliance flights on the cheap especially in business class. However Avianca announced back on September 30th of 2014 the price to buy miles will go up 10% and had changes to their award chart on October 15th which were a devaluation. So what should you do? If you know that you can make your travel work and get the LifeMiles redemption(s) of your choice go ahead and buy the miles however I wouldn't buy them if you don't think you'll use them over then 3-6 months just in case another award chart devaluation comes along. If you go ahead with this offer at the highest tier bonus the miles will cost you US 1.35 cents a piece (C 1.78 cents approx)! So buying 150,000 LifeMiles will cost you US$4,950 but you should get a total of 367,500 miles with the bonus. There some concern that the extra 10% may not be legit and even if it isn't the price to buy with a 135% bonus is 1.4 cents (C1.86 cents) which is still a great deal. Normally a decent feature of LifeMiles is their Cash + Part Miles option but that was devalued over a year ago. This option only requires that you have 40% of the points for a reward but that offer has you buy the rest of the miles (the other 60%) at about 1.56 cents per mile so you are better off buying the whole amount of miles required for an award through this promo.